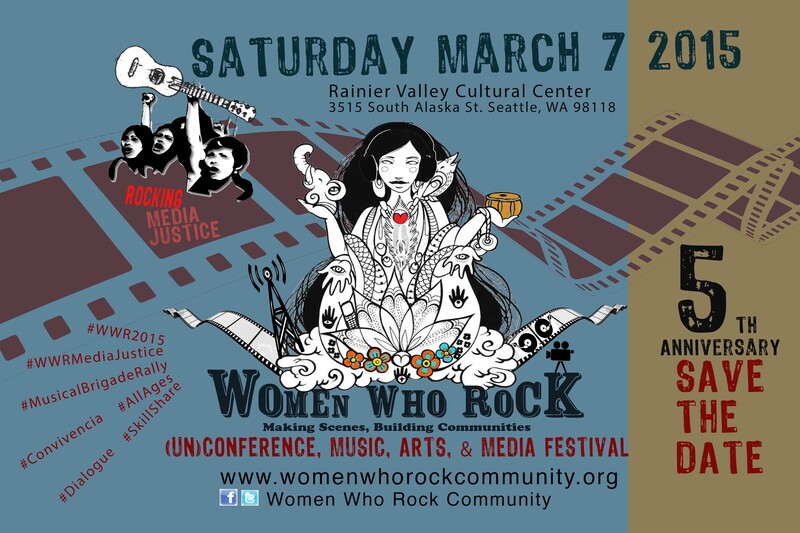 The Women Who Rock (WWR) Community will celebrate our 5th anniversary on Saturday, March 7th, with the 2015 WWR unConference, an event where we strive to create a space for women to participate together in discussing ways for Rocking Media Justice. The 2015 WWR unConference will take place on Saturday, March 7th at Rainier Valley Cultural Center, featuring a moderated roundtable dedicated to solidarity within organizers, roundtable discussions with the community, a skills-share space, where attendees can float from booth to booth, collecting different methods for rocking media justice, a cypher, and a community-created altar. Sharing is caring! Share WWR Facebook photos and use our Twitter hashtags to get the word out. This entry was posted in 2015 unConference, Events, Women Who Rock and tagged women who rock. Bookmark the permalink. ← Save the date for Women Who Rock: Making Scenes, Building Communities 2015!